Hi welcome back as we showcase Chance of Rain today. We designed this set to be fun, versatile and well, isn't it just charming? You've got two friends weathering the rain together, with a little bear that fits right in between them. 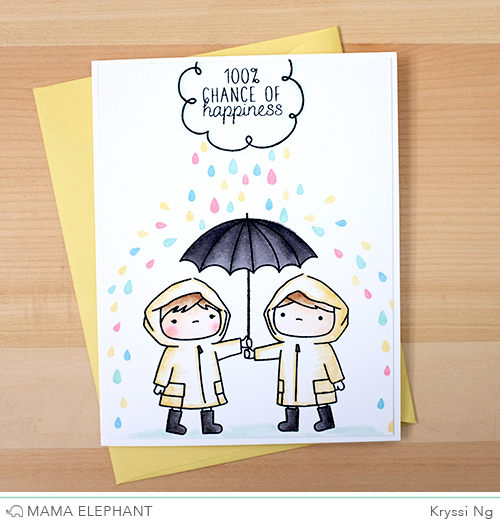 Rain isn't always a bad thing, we've got the most perfect sentiments to pair this set with! So, keep your head up, 'cause blue skies are ahead! Here I created a fun card with minimal coloring with Copics markers. 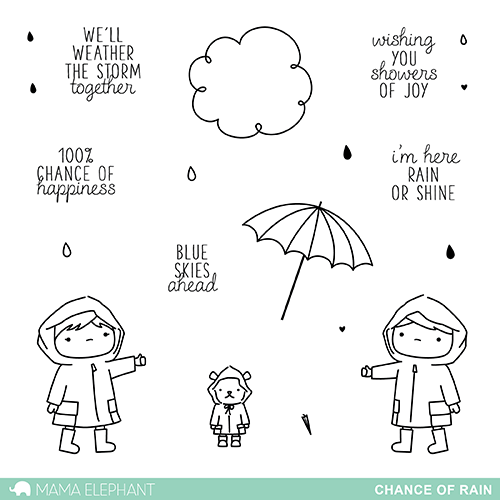 The little girl and boy are sharing some colorful rain underneath the umbrella. Notice how their hands are positioned perfectly so they can be stamped together or individually. They're happy, so their world rains in color! Here's another card I created with the little girl sheltering her little bear friend. The background was loosely washed with the Gansai watercolors. There's really no wrong way to create these types of backgrounds. No such thing as mistakes as you can keep layering darker colors over lights to create a stunning look. I hope watercolors never goes out of style! Angela made a shaker card with falling hearts and stars. She can't seem to pull away from the fun factor and movement of shaker cards. Come back tomorrow as we introduce another set! Oooooooo I love this set! I've been waiting to see this one! Love it! Super sweet, I love how it looks with watercolors! Adorable stamp! I really like the shaker card idea making it rain sequins brilliant! You must be a mind-reader. There's supposed to be showers all week long. Ugh. Love the little kids and their umbrellas. Those little characters are so cute. Love 'em! Aww what a sweet set! This stamp set is soo cute! I love the bear! Too cute! This stamp set is done very cleverly with cute little kids and sayings. 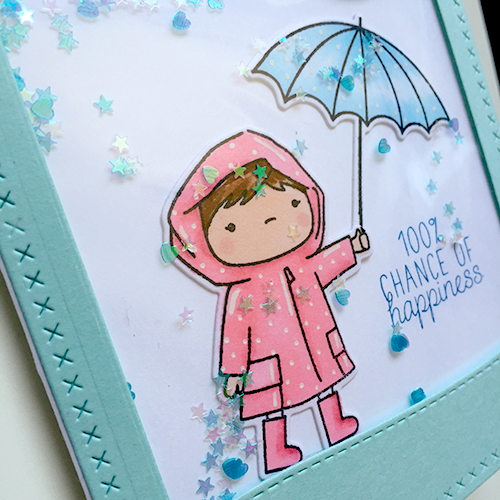 I am totally in love with this stamp set, the little people in this set are adorable & I love the sentiments! Love the sentiments and sweet images! And your cards are wonderful!!!!! I absolutely LOVE Angela M's shaker! Adorable! Another great release! Can't wait to get these in my hands. Adorable stamps and with dies to match! Even better! Thank you so much for sponsoring Kathy's 30 day coloring challenge and for the opportunity to win this FABULOUS release!!! Love it and all I learn from these challenges. Thank you, thank you, thank you! I forgot to say which is my fave. It's hard to pick, but I think it's We'll weather the storm together". I love the shaker card. What great stamp sets......again. This is so adorable. 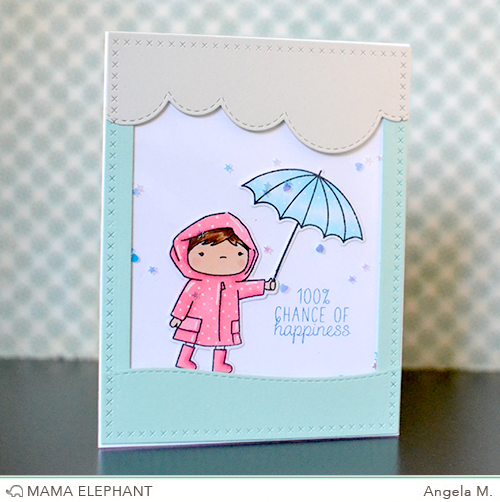 I would love to know how the second card was colored (with the pink raincoat.) Is that copic as well? If so, what color?